This month marks the two-year anniversary of the Current Account Switch Guarantee, and while many consumers have already taken advantage and switched providers, greater momentum could be caused by incoming changes to the retail banking market. Last month the CMA reported that of the 17% of customers who start looking to switch their current account, a staggering 86% don’t go on to switch. It is also estimated that the annual rate of switching stands at just 3%, and worryingly, 25% of switchers move their account without researching the market first. * Meanwhile, frequent overdraft users were found to be the least likely group of consumers to move, due to the hurdles of securing an overdraft facility with their new bank and the complexities of comparing account charges (something that is increasing in importance as average authorised overdraft usage fees have crept up from £4.59 to £6.74 in just two years). Whilst most of the people of the UK are focused on the increasing frenzy of the too and fro politicking going on in Scotland in the build up to September 18th referendum, unbeknown to most including the mainstream media is that there is already a bank run underway not only in terms of flight of capital from Scottish banks but that is hitting the whole of the UK hard in terms of capital outflows. Understand this - It does not matter what the Bank of England states following a YES vote on September 18th - There will be a run on Scottish Banks by panicking depositors just as there was on Northern Rock. Once upon a time the Citibank USD current account was by far one of the best such accounts on the market for depositing USD cheque's in the UK, where typically 1.75% was added to the spot GBP exchange rate and if lucky at best as little as 1.5% or at worst rarely more than about 2.2% with no other fees as long as £2,000 or equivalent was always kept on deposit. Why do banks need to charge for current accounts? Over the last ten years, the Bank of England Base Rate has fallen drastically but overdraft rates have had a ‘cushioned’ fall. The table below shows the average overdraft rate over the last ten years alongside BoE Base Rate. It highlights that although base rate is at an all-time low of 0.5%, overdraft charges are still making a sizable return for the banking sector. We are now five years into the credit crunch and the following table shows how it has affected our personal finances. The Bank of England, FSA and politicians of all parties have been busy all week putting up multiple screens of smoke and mirrors to try and separate themselves from their bankster brethren despite the facts of close relationships between all parties that amounts to negligence to regulate and hold bankster's to account where the fundamental fact remains that despite all of the continuing crimes amounting to an ongoing risk of actual bankruptcy of Britain i.e. continuing to inflict far more financial damage than the likes of Al-Qeeda could ever have hoped to have imagined to achieve, NO bankster criminal has gone to prison! The only consequence so far has been to lose a bonus for a year or two, let alone face the sack. Moneyfacts research has shown that there has been an increasing amount of switcher incentives introduced in the last few weeks. High street lenders including Halifax, HSBC and Santander have all launched deals to attract new customers, offering a cash payment or interest-free overdrafts. The Governor of the Bank of England, Mervyn King, woke up form financial paralysis to warn UK Banks to prepare themselves against the risks of a collapse of the Euro-zone by forgoing annual bonus payments (based on fictitious tax payer funded profits) and instead shore up their capital against the wave of defaults and bankruptcies both banking and commercial that would follow a collapse of the Euro-zone. Citibank for a number of years has provided UK customers a U.S. Dollar Checking account without fees if the balance across all Citi accounts is above £2,000. This has proved especially useful in depositing dollar cheque's that normally attract significant fees per cheque in addition to exchange rate spread mark-ups. As another academic year closes, many graduates are leaving university uncertain of their future. Unemployment remains high and could increase further once public sector cuts are fully realised, leaving limited job opportunities for graduates. The transition of moving from full time study to full time employment can be a difficult period, but its important graduates prioritise on tackling what is likely to be a large student debt. The following table lists Britain's major retail banking groups (separate licences) in terms of the percentage probability that your deposits above the UK compensation limit of £85k and Euro-zone banks 100,000 (current £/E £86k) would be secure in the event of a series of euro-zone debt defaults starting with Greece and that the crisis is contained to these smaller peripheral euro-zone countries i.e. Greece, Portugal and Ireland, if Spain comes under real risk of default then that would require a revaluation of this list as banks such as Santander would come under far greater pressure given exposure to Spanish government debt. The Greeks had set the ball rolling by withdrawing their funds out of their banks during May and June as a consequence of their exposure to Greek Government debt, soon to be followed by Banks across Europe if not already in the process of desperately attempting to pull their funds out of Greek banks ahead of an inevitable debt default, and then from other PIIGS banks and financials, that's banks of Portugal, Ireland, Italy, and Spain as well as Greece on rising default contagion risk. The banks and building societies after losing a court case in April brought by the British Bankers Association, are being forced to repay approximately £5 billion in mis-sold payment protection insurance to their customers that in the vast majority of cases proved totally worthless. Barclays has already set the ball rolling by trying to ingratiate itself with its angry customers by automatically refunding all legitimate claims that have already been submitted to date, with the other banks seeking to write to upto 3 million customers over the coming months. In the current economic climate, current account credit interest rates have fallen significantly. So much so, that a number of providers have decided to scrap paying credit interest altogether. In recent weeks, NatWest and RBS have stopped paying credit interest on all of their current accounts. Recent figures from the Bank of England show overdraft rates at an all time high. As another academic year closes, many graduates are leaving university to enter very challenging times. Unemployment remains high and could increase further once public sector cuts are fully realised, leaving limited job opportunities for graduates. The winners of the 2010 Moneyfacts awards were announced this afternoon at the Millennium Hotel, Mayfair, London. Some 300 industry professionals from leading financial institutions gathered at a special luncheon hosted by ITV News’ Economics Editor, Daisy McAndrew. Despite bank base rate being at an all time low, authorised overdraft rates have hit their highest level in a decade. The average authorised overdraft rate now stands at 14.22%. The last time overdraft rates were this high, bank base rate was 6.00%. Speculation is rife that in tomorrow’s Budget, the Chancellor, Alistair Darling will announce that all UK citizens must be offered a basic bank account from UK banks if they want one. Currently, basic bank accounts are available to the majority of customers, with only a few being declined in exceptional circumstances, including having a previous bankruptcy judgement against them. Standard Life's online banking operations have now been offline for a whole 24 hours. The 41% tax payer owned Lloyds TSB bank continues to declare abysmal losses of £6.3 billion for 2009 against £6.7 billion for 2008 as a direct consequence of the HBOS cancer that continues to eat into the banks balance sheet. The balance sheet suffered a £24 billion bad loans impairment, against profits generated by the branches of £1.3 billion and against £20 billion of tax payer capital injected into the bank and a further £150 billion of tax payer loans and guarantees. Michelle Slade, spokesperson for Moneyfacts.co.uk comments: “The shock decision by the Supreme Court is going to leave some consumers even more disillusioned with banks. “Consumers have seen billions of pounds pumped into a number of banks, but many feel they have seen little benefit. The Halifax (HBOS), Britians biggest mortgage bank that has been bailed out by tax payers saw its banking systems crash several hours ago with no resolution to the problems so far. It looks like the bulk of the banks systems have crashed which include online banking and ATM machine services though branches are reported to be operating normally. ATM's are also down for the other big tax payer bailed out bank, Royal Bank of Scotland (RBS). The Halifax, one of Britains biggest tax payer bailed out banks that was forced to merge with Lloyds TSB to avoid bankruptcy has been busy sending customers correspondence warning of proposed changes in the way it charges fees effective from 6th December 2009. If you want to earn interest on your money, then don’t leave it in your current account. Latest Moneyfacts.co.uk figures show that 83% of all non fee paying current accounts pay just 0.10% or less, with half (49%) of accounts paying no interest at all. As another academic year draws to a close, many graduates are leaving university to enter very challenging times. The recession is having a detrimental effect on the number of jobs available, so it is important that students take their finances seriously. The winners of the 2009 Moneyfacts Awards were announced today at the prestigious Brewery venue in London. Industry professionals from the leading financial institutions and industry bodies gathered at a special awards lunch hosted by Bill Turnbull, of BBC Breakfast and Strictly Come Dancing fame. This widely anticipated and well supported event celebrated the best products and service in the personal finance world, showcasing those providers that continue to support the sector at a time when its success and growth has never been more important. Following on from the collapse of Lehman Brothers during the weekend, the financial sector was expected to be hit hard and to drag the overall market lower by some 5%. Whilst most of the big UK banks experienced falls in the order of 15%, Britain's biggest mortgage bank, Halifax Bank of Scotland (HBOS) crashed by over 30% as clearly hedge funds targeted the bank as a candidate for financial collapse, along the lines of Northern Rocks bank bust in Sept 07. The government propaganda machine were in full swing today emphasing Northern Rock's repayment of £9.7 billion of the approx £27 billion borrowed, whilst at the same time announcing losses of £585 million over the past 6 months, against a profit of £296 for the same period last year, prompting the government to make an equity injection of £3.4billion, which basically means that loans have been replaced by a high risk equity investment the value of which is subject to market pricing, which given that Northern rock is making an annualised loss of over £1 billion equates to virtually zero. On Sunday Gordon's Darling released the statement that the UK Government would nationalise Northern Rock Bank before Mondays stock market open, as the two takeover proposals virtually guaranteed huge profits for the bidders such as Branson's Virgin group, whilst the government would have been stuck with the debt of as much as £50 billions, sat to wait patiently for upwards of 25 years for the debt to slowly be repaid if at all. At mid-day today, Gordon Brown the British Prime minister waded in to support the decision to nationalise the bank in the face of shareholder protests, and said that the delays were necessary so as to weigh potential private sector alternatives to nationalisation. It now seems like another era when I first warned of the problems specifically facing Northern Rock bank back in August 2007, some four weeks before the run on the bank occurred and the interbank money markets freeze hit the headlines. Over that period we have witnessed the initial £2 billion of tax payer loans and guarantees mushroom to an estimated £55 billions today. The UK Government effectively announced the nationalisation of Northern Rock Bank as the Treasury extended its guarantees beyond the current estimate of monies loaned of £25 billion to cover all deposits and debts of the Bank, which amounts to more than £100 billion or the annual UK health service budget. The Bank of England is today publishing its Financial Stability Report. This provides an initial assessment of the causes of the recent financial turmoil, lessons to be learnt and prospects ahead. A consortium led by Richard Branson's Virgin Group has submitted a rescue offer to the Northern Rock Bank's board of directors. Northern Rock's board of directors is meeting to agree to the deferment of the interim dividend totaling £59 million, announced in July 07 just prior to the impact of the credit crunch. The dividend amounts to 14.2p per share and would represent 8% of the current value of the company. Political Ravishment! 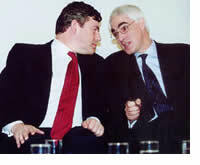 Or, a Tale of Two Bankers "...O you villain! Have I kept my honor so long to have it broke up by you at last...?" THE OLD LADY'S in danger, and not for the first time. As a political cartoon by James Gillray reminds us each morning, hung by the door here at BullionVault , the Bank of England's virtue came under attack in the late eighteenth century. The British Government stepped in today to guarantee ALL Savings in Northern Rock Bank at 100% in an announcement a few minutes ago. The chancellor of the exchequer, Alistair Darling stated: "I can announce today that following the discussions with the Governor (of the Bank of England) and the Chairman of the FSA, should it be necessary, we, with the Bank of England would put in place arrangements that would guarantee all the existing deposits in Northern Rock during the current instability." The run on Northern Rock bank by customers withdrawing hard earned savings could have been avoided by a decent amount of compensation security. The current limits set some 10 years ago are far too low to offer much security to all but minimal savings levels. UK bank and building society mergers do not benefit their customers, according to a new study. An analysis of UK bank and building society mergers has found that although these mergers have generated substantial efficiencies for the banks concerned these benefits have not been passed on to customers. The OFT will today commence proceedings in the High Court for a declaration on the application of the law in respect of unauthorised overdraft charges. Michelle Slade of Moneyfacts.co.uk – the money search engine, comments:“Current accounts are big business for the banks, and this has been made clear by several banks who over the last six months have been offering deals to entice you to switch. Not only does it secure them your prime current account, more importantly, it offers the opportunity to cross sell their whole range of other products. Andrew Hagger, Head of Press at Moneyfacts.co.uk – the money search engine comments:“On leaving university, searching for the best current account provider may be the last thing on many graduates’ minds. But by taking the time to shop around, they could find an account that suits their circumstances and also save some money into the bargain. “There are only six UK providers of graduate finance, so choice is limited to the major players. Find out why some feel the Federal Reserve System is a "bunch of organized crooks" and others feel its practices "are in violation of the U.S. Constitution." Discover why experts agree the Fed is a banking cartel that benefits mainly bankers, their clients in need of easy money and a Congress that would rather increase the National Debt than raise taxes. This important, Telly Award winning documentary is inspired by the well-known book, The Creature From Jekyll Island by G. Edward Griffin. “Alliance & Leicester has relaunched its regular saver, but savers should still be ware of the limitations that such an account offers. Whilst the account offers a market-leading rate of 12%, this is limited to a total investment of £3K over a year, spread across maximum monthly contributions of £250. The account also requires that a Premier Current Account is opened, which pays 1.49% credit interest; that’s 4.45% lower than the award winning Premier Direct Account which Alliance & Leicester offers. In a recent statement the Office of Fair Trading announced that it is launching an study into personal bank current account pricing, alongside a formal investigation into the fairness of charges for unauthorised overdrafts and returned items. • 25% of no notice accounts pay rates below 3.10%, the CPI figure, while a staggering 69% pay less than 4.80% - RPI. The MarketOracle.co.uk asks: of the top UK banking & financial institutions, in your experience which do you consider offers the best personal banking services ? Michelle Slade, personal finance analyst at moneyfacts.co.uk – the money search engine, comments: “If you don’t trust your bank, or feel it is not offering you the best customer service, products or rates then why not vote with your feet and switch providers? “The current account war shows little sign of abating, with several providers battling to offer the best current account rates and deals. So why not reap the rewards from switching? You will certainly find some great rates and perhaps an additional financial incentive too. “In previous years Alliance & Leicester comfortably held the top spot for current account credit and debit interest rates, but more recently its position in the credit interest best buy tables has been hotly contested by the likes of Halifax, Abbey and Coventry BS. •Barclays is the least trusted bank in Britain. •Two-thirds of “Big 5” customers do not trust their banks to sell them the right products. •One in eight customers claim that they have been victims of mis-selling. •One in six people have had money go missing from their accounts. In response to consumer concerns over bank current account charges, the OFT has today announced an in-depth study of retail bank pricing. This will sit alongside a formal investigation into the fairness of bank current account charges. Full details of the study will be announced in late April, and it is expected to be completed by the end of the year. This study follows an initial review carried out by the OFT into these charges. The finding of this initial review is that the OFT shares the public concern about the level and incidence of bank current account charges, but it recognises that the application of the general principles it set out in 2006 to the banking industry is not straightforward and that a more detailed examination is needed.